Come on by Linden Street Brewery for our ‘Town Quarterly Party! Come party in our parking lot with great beer, great bands, great food, and great weather! We’ll be releasing a new Rye Summer Bock beer and fundraising for the Town Park and My Yute Soccer. Bless and Build! We will be brewing a special edition of Morpho Herbal Ale for Pride weekend. Like the original, this gruit will be feature yerba mate, bay leaves, and hibiscus, but more of each and it will clock in at 8% alcohol. Giddyup! Come by Cervecería de MateVeza for the festivities on June 29th and June 30th and brace yourself! Two Beer Festivals Happening TODAY! The 2013 Hop N’ Barley Beer Festival will be held at Skypark in Scotts Valley. This afternoon community event will feature more than 100 beers, music by five local bands, bocce ball, food for purchase, and a children’s area. The park is dog-friendly, and admission is free for those not tasting beer. Proceeds will go to the Community Housing Land Trust of Santa Cruz County. Enjoy great craft beer and sample mouthwatering BBQ throughout the day. CBF isTHE event of the year for any beer or BBQ enthusiast. CBF’s main goal is to shine a light on the craft beer movement and celebrate great beer. With over 70 craft brews on tap, mouth watering food, bocce ball and live entertainment with three great live bands. Back by popular demand the electrifying 14 piece tribute band to Michael Jackson….FOREVERLAND. Stumptown Brewery Beer Revival and BBQ SOLD OUT! Beer Tasting from 1 – 5 p.m. Live Music ’til 6 p.m. Entry fee includes your Beer, Cider, and BBQ tastings for the duration. 30 Breweries and 30 BBQ teams “If you can’t have fun at this one … you can’t have fun.” Don’t take our word for it, find someone who came last year and ask them if they’ll be coming back. Once a year at the time of the Autumnal Equinox, homebrewers from all over Northern California make the trek to the little town of Dobbins and call Lake Francis their home for two days. Here they proudly fly the colors of their homebrew clubs and eagerly share well-crafted homebrew, rivaling some of the best known craft breweries. Tickets go on sale July 14th at 10am! This popular annual brewfest and festival of all things bicycle in beautiful Fairfax, CA (the birthplace of the mountain bike) features over 30 handcrafted beers from the West Coast’s best brewers (see full list below). All proceeds from the brewfest benefit the Marin County Bicycle Coalition and Access4Bikes and their efforts to expand Marin County’s network of bike lanes, pathways and trails. 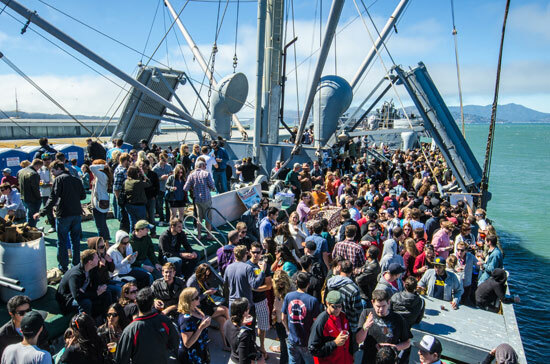 Enjoy over 50 different beers made by San Francisco breweries, while soaking up the salty air, sunshine, live music, food, and spectacular views of the Golden Gate Bridge, Alcatraz and San Francisco. Also, check out Brooklyn Brew Shop’s list of events happening this weekend around the country. And ceck out this mega calendar of listings around the world!